Congratulations to our most recently promoted students! You’re preparations certainly paid off at the test, well done! Omedetōgozaimasu! Only 6 weeks until Miho is here for Summer Club!!! We have only five spots left for each summer session so please be sure to save your spot if you’re looking for an activity to fill their summer with fun, learning and exercise! 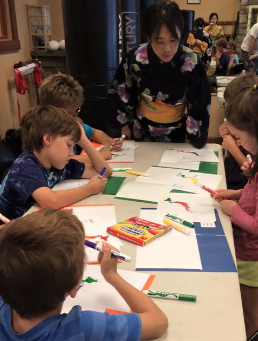 Here’s some pictures of Miho and the games she plays with her Japanese students. It’s going to be a really special experience for our students this July and August during Summer Club. We hope your child has the opportunity to join us for one or both weeks this summer! We are THRILLED to announce a special guest that will be joining us at Summer Club this year! Miho Takahashi was born in Japan, where she studied Japanese language education from one of the most prominent Japanese language scholars, Dr. Miyaji. She’s taught Japanese at the University of Oklahoma as well as taught business professionals as well as lawyers and university professors privately for over 15 years. 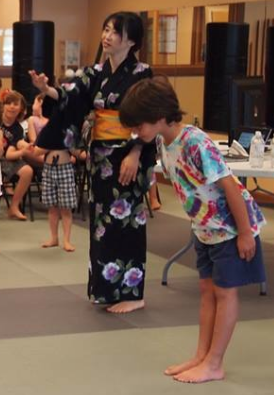 She now owns North Shore Japanese Language Education and Services in Beverly and offers her language and cultural education services to students. We can’t wait for our July and August session of Summer Club this year and certainly hope you can join us for these very special events. We still have a handful of openings in both sessions, so if you’re interested and not yet registered, please email us or let us know next time you’re in the dojo. Space is limited, and we expect the camp to fill up, so please don’t wait if you’d like to reserve a spot for your child. Have a wonderful day and we will see you soon! Summer Club is only 6 weeks away! We are finalizing our registration for the July session of Summer Club and we have a couple spots left. We wanted to be sure everyone had a chance to register before school is out and summer is in full swing. The first session of our week long Summer Club is July 18-22 and the second session is August 15-19. Each session runs from 9am – 1pm with extended care until 2pm. If you would like to register please let us know as soon as possible as we are nailing down some final details. We can’t wait for this summer; it’s going to be a great one here at the dojo! Looking to learn about the amazing benefits of martial arts training for you or your child? Visit our OPEN HOUSE Tent Event on 5/21 from 8 am – noon at the Kennedy Fields at 83 Pine Street, West Peabody. We will be teaching the kids karate basics- kicks and blocks, as well as using the agility ladder and obstacle course for speed and balance practice. Watch your loved ones have fun while learning control, self-discipline and respect. Plus… we’re giving away tons of cool prizes that kids just love. We hope to see you there! Two belt exams in two days and 14 new belt recipients! Congratulations everyone, you certainly all worked hard and earned your new ranks. Enjoy the weekend, and we will get back to training on Monday! OSU!!! May 9, 2016 – We had a great time on Friday and Saturday at the dojo! Thank you to all the moms that came to the dojo to support your child by joining class! We hope you have a wonderful Mother’s Day! …Father’s, you’re next! In honor of Mother’s Day, we’re inviting all of the awesome moms here at the dojo to join us this weekend a fun filled karate class with your kid(s). We’ll be doing loads of cool drills and exercises that are perfect for parents and we know you’re child would love to see you in action. Please join us and make a great memory with your son or daughter – you’ll have a really good workout and loads of laughs too. We hope to see you there! What a great group of students and friends we had on Saturday night for our biggest Karate Fun Night ever! Thank you everyone for coming down and joining us a night filled with fun, games, a movie, pizza and popcorn! Congratulations to Sempai Bryan Muse, who formally began his Assistant Instructor Training Program last night. Mr. Muse will be serving as the formal class sempai each Thursday evening alongside Sensei Quimby where he will be assisting in our Adult Beginner class each week. Thank you for all of your hard work and dedication sempai – we’re excited to have you as part of the team! We just scheduled our next “KARATE FUN NIGHT” which will take place here at the dojo on Saturday, April 30th from 5:00 – 9:00 pm. Karate Fun Night (a.k.a. : parent’s night out) is a night for the kids here at the dojo where they can get together with their buddies and have some good old fashion fun. We’ll be “kick-en” it up with loads of great karate action, fun contests, games, eating pizza, and then watching a cool animated movie out on the mat. Space is limited, so if you’re interested, please sign-up at the dojo, or email us and we’d be happy to put your name on the list. We’re so proud of all the students that participated in our April Belt Grading. Your hard work and perseverance were truly inspiring. Keep up the outstanding effort and congratulations once again.